A reader wondered how much data his smart phone would use, with GPS running the whole time, on a road trip to Florida. First the good news: The GPS system doesn’t use data. Now the bad news: Downloading maps does. One way to avoid data charges is to get a free app called “CoPilot GPS,” which currently has over 14 million users. (We wrote about it once before, but didn’t realize how crucial it was for saving data charges — since we’re on an unlimited data plan, but with very few talk-minutes.) After you install the app, download the region or country you’re interested in. 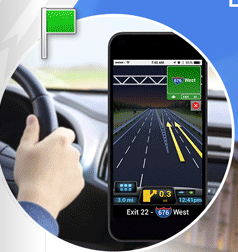 Now you’re ready to see maps and directions offline. You don’t need any cellular or Internet connection to make this work.